WarmFörm™ Slab Forms are remain-in-place, self-shuttering, insulated concrete formwork used to create slab-on-grade foundations that comply with the IRC code for Frost Protected Shallow Foundation applications*. WarmFörm is based on decades of testing and tens of thousands of installed examples in Northern Europe where it is has evolved as the preferred formwork system, as it combines insulation and formwork in one elegant solution. Because the outer face of WarmFörm comes prefinished with a cement render, there is no need to finish the exposed stem wall face after construction, and because the prefabricated elements are made to exact sizes, and there are no stakes to pound making dimensional accuracy of the finished slab is easier to achieve. WarmFörm is especially suited for radiant heat slab applications in cold climate construction since the heating coils can be placed on the insulation before the rebar is placed. The slab and beams are formed in one pour, and there is no formwork to strip. 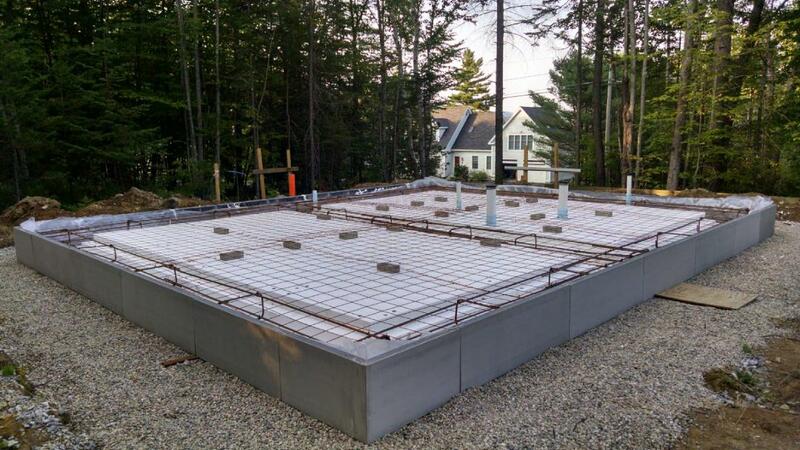 A slab on grade foundation is the least expensive way to build. Yet North Americans are only accustomed to slab on grade in frost free areas. WarmFörm allows builders in climate zones normally requiring 4 foot or deeper foundations to build shallow slabs that conform to the code, but costs less to install. If you want to make a highly insulated structure there is no better way to be sure that your insulated envelope completely surrounds your building. WarmFörm is based on foundations systems that have been commercialized in Scandinavia for over 30 years. Over these many years builders in Scandinavia have refined this product to make it efficient, easy to build, and reliable. We in the US have the benefit of being able to learn from their science, and to take advantage of it without the long learning curve. Today there are numerous manufacturers offering a range of similar products, but up until now, builders in North America were left to fabricate their own insulation systems around existing slab and stem wall configurations. Nearly every new home in Scandinavia is built on frost protected slab like WarmFörm because it is a more efficient way to build a slab for cold climates. ByggHouse LLC collaborated with Bensonwood Homes to build the first prototype of our product, and now offers WarmFörm to to anyone in North America who wants an insulated slab form product in material dimensions that functions identical to the systems used in Scandinavia: Välkommen to WarmFörm. WarmFörm is code compliant, however, in our experience code officials are generally unfamiliar with the provisions for Frost Protected Shallow Foundations described in the International Residential Code section R403.1.4.1 Frost protection, and some explanation of the system is necessary. It is your responsibility to design and construct your foundation in accordance with code, respecting all site and soil conditions and local regulations. 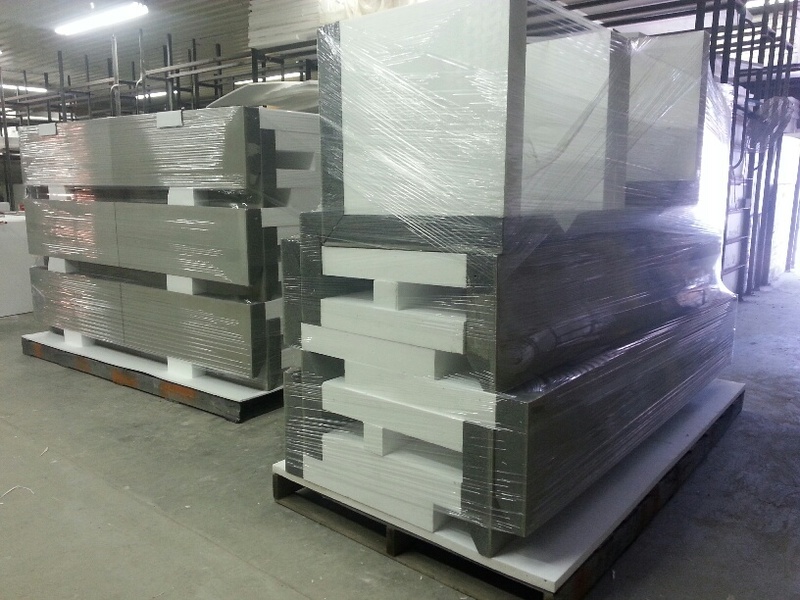 WarmFörm is currently offered on a project by project basis delivered in stock sizes by common carrier to your location. We will provide you a firm price quote and review your project’s foundation plan to check that you have ordered the correct components to complete your job. WarmFörm elements will be in the neighborhood of $25 per foot of perimeter. See links in column at right for our full price list. The WarmFörm system consists of edge “elements” which are laid out on site to form the perimeter of the slab. These elements are configured as either running edges (“L Elements”), or as 90 degree corners (“Corner Elements”). Inside corners are formed butting two L Elements, and off 90 degree corners are created by trimming L Elements to the desired angle. Elements are cut easily in the field with hand saws, and are attached to one another with provided hardware that clamps and holds the edges together. No glue or foam is needed. The center of the WarmFörm slab is filled with additional foam layers which determine the shape of the slab and grade beams of the foundation structure. Grade beams rest on the horizontal leg of the edge Elements and building loads are transferred through the high density foam to the stone layers below, and on to the site soils. We can currently deliver an order with approx. 4 weeks lead time. We are also speaking with building material suppliers interested in stocking WarmFörm, but currently we are working on a job by job, custom order basis. • WarmFörm eliminates digging footings, and greatly reduces the amount of earthwork required to create a house foundation. Because this is a Frost Protected Shallow System there is no need to dig deep footings below the frost line. This means preparation of the site is faster, and it takes less time and money to prepare building foundations. • WarmFörm is fast and eliminates all of the traditional concrete formwork construction, and removal activities. Two workers can typically install WarmFörm for an average size house in a day. Prep for radiant heating and reinforcing bars might take two more days. At the end of day three you can be ready for concrete. After it is poured you are done. There is no formwork to strip or remove since WarmFörms remain in place. WarmFörm is Fast. • WarmFörm provides a highly insulated base to your building, and makes affordable slab on grade construction a desirable option for cold climates. For homeowners seeking an energy efficient home this is the easiest way to deliver a highly insulated foundation system. For builders managing costs, this is the least expensive way to build a foundation in a cold climate. WarmFörm is Energy Efficient.